This beer is one that myself and my father-in-law made. It was a recipe I got online because we wanted to try making an IPA. It is an American style IPA that isn’t too hoppy with only 65 IBUs. 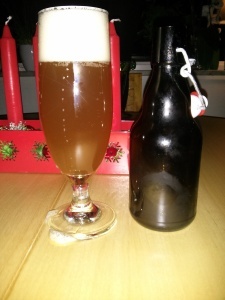 It has very good carbonation with a large head, a nice pale cloudy colour to it. The nose is of floral and grapefruit and the flavour is sweet and fruity all the way through. Nothing overpowering, this beer is very well balanced and an absolute joy to drink. Rating: 4/5 – Probably the best homebrew we’ve made to date. Will be making it again. Den här har ni lyckats mycket bra med. Perfekt faktiskt.